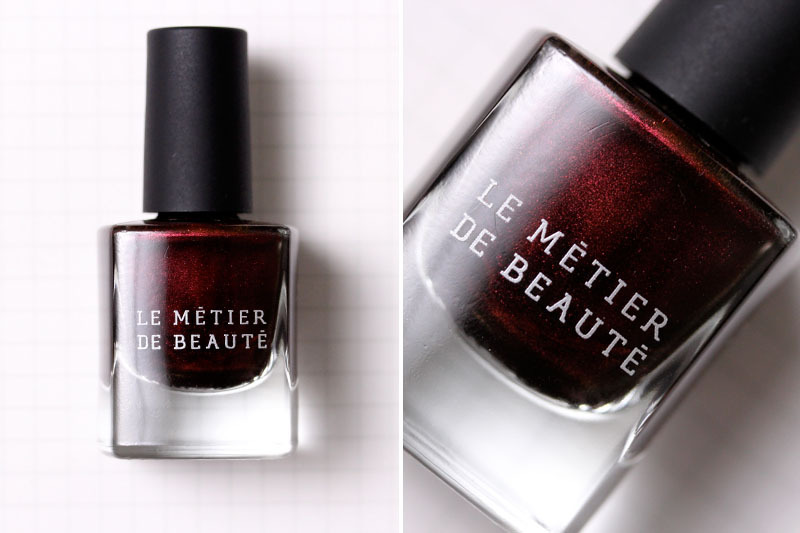 I almost forgot that Le Métier de Beauté doled out four nail polishes for their fall collection. I was sent Hot n' Saucy and have been so smitten with this blend of brown and red that I've worn it three times in two weeks. You can't see it clearly below (I didn't apply top coat) but on your nails it looks exactly like what you see in the bottle above – a deep cocoa base with red undertone infused with fine red shimmer. Le Métier de Beauté Hot n' Saucy retails for $18 and is available for pre-order at Neiman Marcus. If you would like to get yours immediately, I believe I saw it displayed at the Bergdorf Goodman counter. You can reach them at 212.872.8612. Full disclosure: This entry contains a sample product(s) sent by PR or the manufacturer for editorial consideration. OMG i love this shade!!! Gorgeous!! oh..and btw...your hair is ADORABLE!!! The lipstick colour paired with the 'Hot n Saucy'.... BOOM- PREGNANT. OH GOD. I need this in my life. So SO STUNNING! On topic, the nail polish is gorgeous, and I love the lip color too. Very pretty nail color! I am curious whether this looks similar to Chanel Malice? It looks very similar to Malice from Chanel. Love your hands!